The US-led coalition in Iraq will hand over power to a transitional government by June 2004, the Iraqi Governing Council has said. 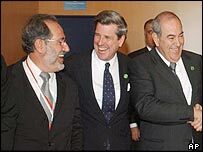 The announcement came after Iraqi leaders met the US chief administrator, Paul Bremer, in Baghdad. Mr Bremer had earlier returned from the US, where plans for a faster handover were agreed at the White House. The transitional body will prepare for a full sovereign Iraqi government by 2005, following a general election. A BBC correspondent in Baghdad says the plan is a much faster route to Iraqi sovereignty than the one previously laid out. The move comes in the context of daily attacks on coalition troops, which continued on Saturday with two US helicopter crashing in Mosul and fresh blasts in Baghdad. Nevertheless, President George W Bush has insisted that US soldiers will remain in Iraq until it is "free and peaceful". Council President Jalal Talabani - speaking after the meeting with Mr Bremer - said the transitional body would be selected after consultations with "all parties" in Iraqi society. Sunni Muslim council member Adnan Pachachi said the move would "restore sovereignty" and give "a chance to a representative of the Iraqi people to represent Iraq". President Bush described the revised handover plan as "an important step toward realising the vision of Iraq". Meanwhile, 17 coalition troops were killed and five injured after two US Black Hawk helicopters came down in the northern city of Mosul. Unconfirmed reports suggested one helicopter had been hit by a rocket-propelled grenade. Earlier, one American soldier was killed and two wounded by a roadside bomb in the centre of Baghdad. An explosion was also heard in Baghdad on Saturday at about 1635 local time (1335GMT), with black smoke seen rising over the city centre. Insurgents are now mounting about 30 attacks a day and have killed at least 160 US soldiers in Iraq since Bush declared major combat over on May 1. 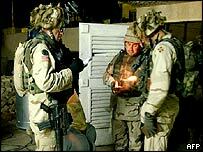 US forces in Baghdad have hit back in the past few days with "Operation Iron Hammer", employing air strikes to destroy buildings they say have been used by insurgents. But more Iraqis have died in the guerrilla attacks than coalition troops - one estimate puts the toll at about 200 civilians since 1 May. Under Mr Bremer's initial plan, a new constitution would have been drawn up before any transfer of sovereignty could have taken place. But the new, speeded-up blueprint, gained positive reaction even before the announcement on Saturday. "This is good for everyone," said council member Ahmed Chalabi, according to the New York Times. "We will have the US forces here, but they will change from occupiers to a force that is here at the invitation of the Iraqi Government," he was quoted as saying. Representatives of the majority Shia population also appeared pleased by the new proposal. Ayatollah Ali al-Sistani, the most senior Shia cleric, had issued a decree that the constitution should be written by an elected body - not the US-appointed 24 member Governing Council. "Instead of starting with the constitutional process, it will come at the end of the road," said Adel Abdel-Mehdi of the Supreme Council for the Islamic Revolution in Iraq (Sciri), quoted by the Washington Post. The BBC's David Bamford, in Washington, says those who speak for the Bush administration have begun to justify this policy reversal as though it is not a reversal, but the next logical step. The US hopes that this weekend's announcements will put its involvement in Iraq in a new light, that will have the effect of curbing the attacks on its military, he adds. "They'll be a new assembly by next spring"
"We will leave when they can manage their own security"